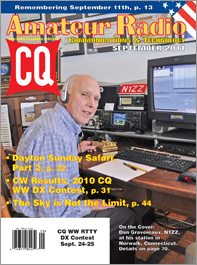 September 2011 marks the 10th anniversary of the 9/11 terrorist attacks on the United States and the September issue of CQ starts out with a retrospective by Public Service Editor Richard Fisher, KI6SN, and recollections shared by some of the hams who were on the scene on that dark day a decade ago. We get back to the present day with Part 2 of our annual guide to new products introduced at Dayton, presented by New Products Editor John Wood, WV5J. This installment covers antennas and accessories. Next, we've got the CW results of the 2010 CQ World Wide DX Contest, with yet another record number of entries (6,129 - up 163 from last year; and 12,700 for both SSB and CW) and 34 new individual records, including first-time records for the new assisted categories. Here are the very top scorers: High Power - EF8M (RD3AF, op), repeating his 2009 win; Low Power - V26K (AA3B), another repeat; QRP - F5MUX; Assisted - CN3A (IK2QEI); Assisted Low Power - VP9I (wa4pgm); Multi-Single -P33W, yet another repeat winner; Multi-Two - CR3L, one more repeat win; and Multi-Multi - C5A. Congratulations to all! Click here to view the Expanded Results. 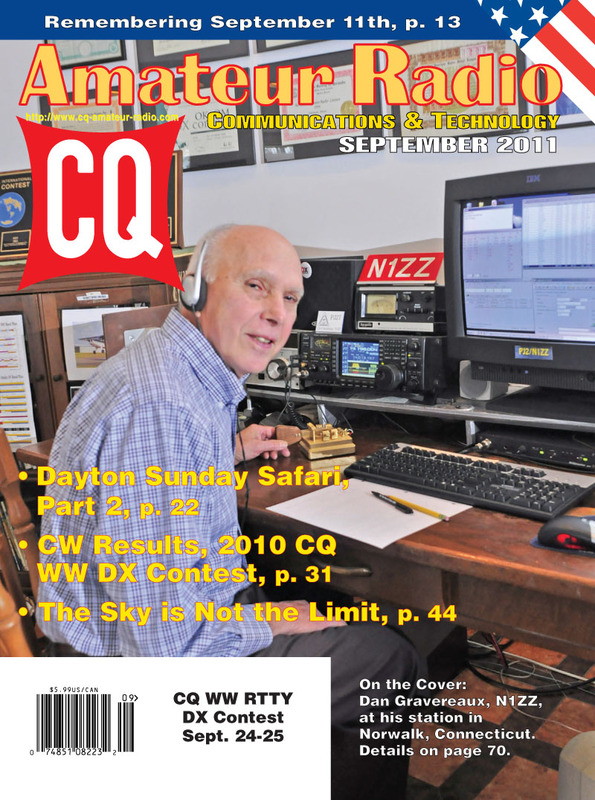 We've also got the rules for the 2011 CQ WW DX Contest (click here to view). We also have W1RC's story on establishing the KA1SKY club station at the McAuliffe-Shepard Discovery Center in New Hampshire, "The Sky is Not the Limit! "; an end-of-summer article from Ted Leubbers, K1AYZ, on the station he's built in his park model trailer at his summer QTH in Maine, and a tutorial from Phil Salas, AD5X, on "Using the Inexpensive TB-105 Thrust Bearing with Low-Cost Rotators." Our September columns start out with "Math's Notes," in which column editor Irwin Math, WA2NDM, writes about working with plastic homebrew housings. 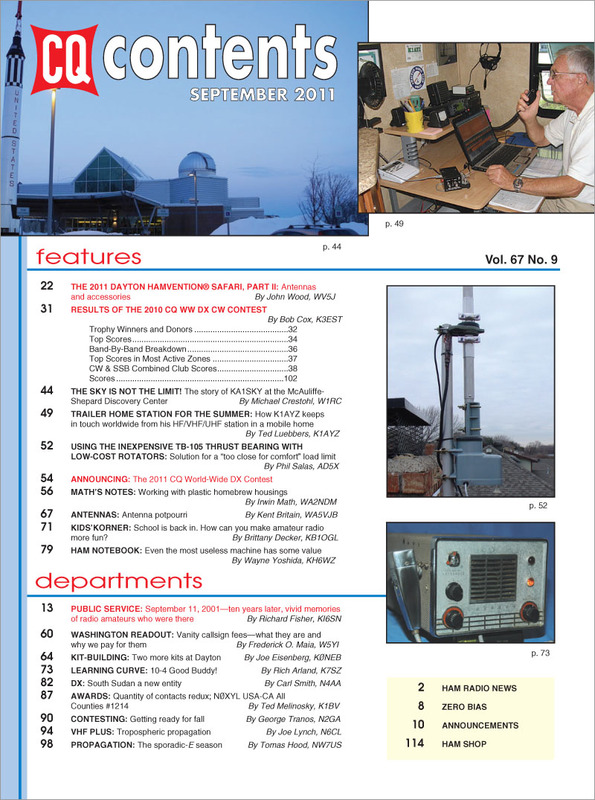 "Washington Readout" editor Fred Maia, W5YI, explains why there are fees for vanity callsigns and how they're determined each year, Kit-Building Editor Joe Eisenberg, K0NEB, checks out two more new kits featured at Dayton, and Antennas Editor Kent Britain, WA5VJB, covers a variety of topics in his column this month. "Kids' Korner" editor Brittany Decker, KB1OGL, looks at bringing amateur radio into school (yes, it's back-to-school time!) and how to make and keep it fun; "Learning Curve" editor Rich Arland, K7SZ, discusses converting old CB rigs to ham use; and "Ham Notebook" editor Wayne Yoshida, KH6WZ, reports that "Even the Most Useless Machine Has Some Value." DX Editor Carl Smith, N4AA, introduces the new DX entity of South Sudan; Awards Editor Ted Melinosky, K1BV, highlights some awards that just require you to contact a lot of stations in a target region, and Contesting Editor George Tranos, N2GA, focuses on getting ready for the fall contest season. 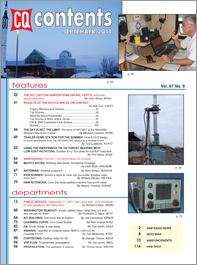 Finally, we have two columns looking at different aspects of propagation that mostly impact the VHF bands, VHF Editor Joe Lynch, N6CL, writing about tropospheric propagation (tropo), and Propagation Editor Tomas Hood, NW7US, on Sporadic-E (which affects the upper HF bands as well as VHF). That's a brief look at what's coming up in the September issue of CQ magazine, which should be on newsstands and in subscribers' mailboxes by late August. For information on becoming a CQ subscriber, click here!